Today was one of those days you never can prepare for or really put into words, but are so grateful to God that you had it. After the faithful hard labor this team has put in to each project and to the camp that we already finished, we took it a bit easier this morning. We headed out to the Ranch to wrap up a few projects and play with the kids before our big community outreach. We finished up the chicken coop and even got 20 of the chickens we purchased inside! They were really enjoying their new digs and we can’t wait until they start producing eggs. This will help so many areas of the Open Hearts Ministry – from eggs for the teams that stay here, both Rescue Homes and in the future for the campers at Ruby Ranch. A simple project will prayerfully reap a great benefit for the future! We were a bit sad that we weren’t able to complete the stairs project. 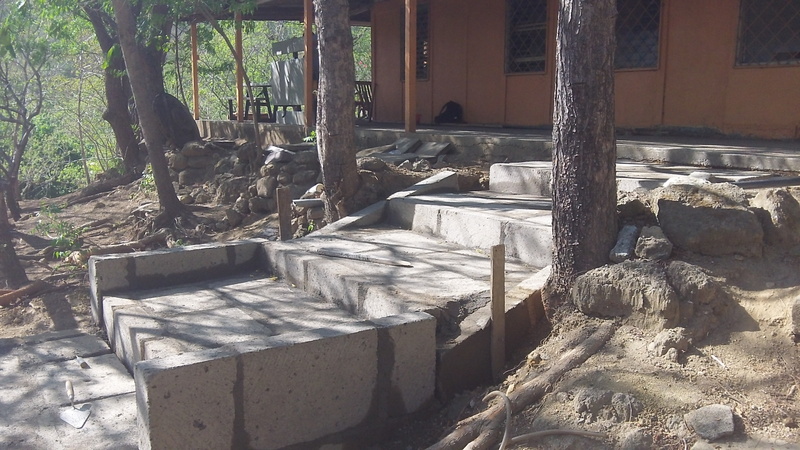 We did all that we could by moving the blocks and mixing concrete, but it will just take more time. Thankfully, we’ve got two great Masons on the job and we will be able to leave money for them to complete the work. But you know, sometimes that is just how the life of a Christian works. We may be one chain in the greater link or one cog in the gears that are moving things forward. So even though we always love completion, we are happy to have served our role of getting the project going! Some of the morning was also spent on a few smaller projects and of course, playing with the kids. We opened the water slide up in the afternoon and had a blast going down. It’s actually crazy to think how this community has been blessed by just the early stages of the Ranch. We see the vision and are excited about it’s continued development. Four o’clock was go time for our community outreach, but of course we are in Nicaragua, so that means Nica time. But we were shocked to pull up to a great crowd that kept growing. Pastor Carlos welcomed everyone and then I had the opportunity to share why our team comes and continues to minister in the Las Parcelas community. We also presented the church with 40 new chairs for their building. Amazingly, but just like God, Pastor Carlos mentioned that they had been praying for chairs and this was an answer to prayer. Of course… God loves to show off like that. We also presented the church with 50 Spanish Bibles. I also took the had the privilege of sharing the Gospel with all those in attendance. I am always humbled and grateful for the opportunity to call people to repentance and faith in Christ. We are praying many turned to Jesus and will continue to fellowship with this church. After dinner, we served the whole crowd dinner (we lost count at over 125 plates). It was a delicious meal of arroz con pollo. At one point, we think God blessed and broke the bread to continue feeding the crowd and our team. After dinner we did a crazy game with the teams from camp – a race to see who could get the most cheese balls on a shaving creamed face of one of our team leaders. The kids loved the game but they loved the piñata even more! We had candy, glow necklaces, balls, sunglasses and whistles flying everywhere. When everything calmed down we started allowing families to enter to choose flip flops for their family. These were the flip flops that were donated last year from all over the country (through Craft Hope). We brought down a full load last year and still had more this year to bless families with. They were so excited to receive a new pair. The camp kids also received their art project – a picture frame with a photo of their camp group. Finally, it was time to say goodbye. This was the most difficult part of the night and we were all overcome with emotion. Goodbyes are never fun, especially when we know the miles between us. But we leave knowing our hearts are joined by the Gospel and intertwined with each other. We sent them off with our love and promise to see them again next year. God is moving in our hearts for sure. Tonight was a great example of the power of the Gospel to work in and through us. We know it isn’t about us. We were blessed to be the vessels God chose to use. Please keep praying that God will keep working in us – making our hearts tender and receptive to the Gospel in our lives!